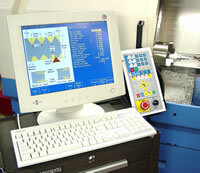 Complete CENTROID turn key CNC control package prices. M-400S CNC control packages are designed for installation on new machinery, as well as retrofit upgrades of existing nc/cnc equipment. Designed for knee mills, bed mills, and CNC routers, the M-400S can be installed on a wide variety of equipment. Unlike other controls, the CENTROID M-400S is a working, completely assembled system -- drastically reducing installation time. 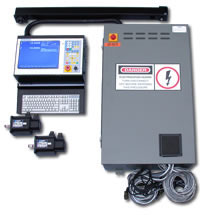 Click here for more M-400 information. With all the power of the M-400S, the M-39S features an optional remote operator's control pendant. With the remote control pendant you can take the control to where the work is, great for job and tool setup. Excellent for large format machines like router tables. Strong magnets on the back of the pendant hold it in place. Use it semi-permanently mounted or hand-held. The M-39S is supplied completely assembled ready to run -- all you do is connect your own VGA monitor and keyboard. Completely assembled, tested and ready to install on a knee mill, benchtop, bed mill, router table or custom machine. Designed for new lathe and retrofit upgrades of existing nc/cnc lathes, the T-400S is a complete control ready to install. 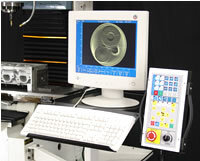 You will be able to get more work through the machine with fast part programming, simple tool and part setup, and constant surface speed. This is a completely assembled system -- drastically reducing installation time. The T-39S is the T-400S's little brother, same CNC control inside, different operator's configuration. The T-39S can be equipped with an optional remote control pendant that is hand-held for convenient setup of jobs and tools, and can then mounted to any magnetic surface for the job run. Any standard VGA monitor can be used, even large 19 and 21 inch units work great for those operators with bi focals! You can also use any standard PC keyboard, and for those of you who like sealed keyboards, ours is optional and plugs right in. T-39 is flexible and can be mounted on the machine in a variety of ways. 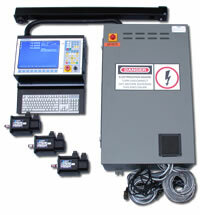 This is a completely assembled CNC control system -- which drastically reduces installation time.